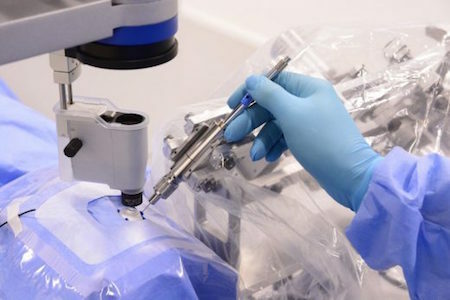 A new microsurgical robot developed in Belgium has some pretty steady "hands". For the first time ever, a team of eye surgeons were able to inject a thrombolytic drug directly into a patient’s retinal vein to dissolve a blood clot. It was a success despite the fact that the vein is as thin as human hair thanks to a surgical robot developed by researchers from KU Leuven, a university in Belgium. The condition they treated is called retinal vein occlusion, and it leads to reduced eyesight and blindness. At the moment, doctors can only suppress its effects with monthly eye injections, because the retinal vein itself is only around 0.1 millimeter wide. It’s just much too thin for manual injections when the drug has to be administered for 10 minutes straight. To address the issue, the researchers created a robot that can help a surgeon insert the needle precisely and then hold it perfectly still. They also designed the 0.03 millimeter needle, which is three times thinner than human hair, needed to inject the drug into the tiny vein. According to the university, the method successfully dissolved the blood clot and the patient is now doing well.